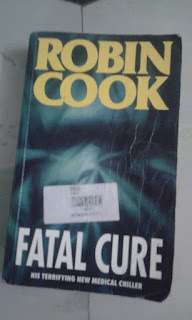 Fatal cure is a thrilling book which comprises of 5 characters named David,Angela,Child,Sadist and Young family.Fatal cure tells us the story of two young doctors Angela and David Wilson,with their 10 year old daughter who suffers from a chronic disease cystic fibrosis who are lured to a small town in Vermont to start a career. David gets a job as an internist with the local HMO,while Angela gets an offer from local hospital as a Pathologist. The story takes aim at managed care and health maintenance organizations. David and Angela quickly find out that their idyllic town harbors dark secrets. Patients at the local hospital keep dying prematurely. The hospital grounds are terrorized by a sadist and that sadist killed the girl and the young family is shocked to find a dead body in their basement.Angela is tortured and harassed by the sadist and David soon experienced the wrath of the HMO administrators for spending too much time with his patients and ordering too many tests and hospital stays. David and Angela end up not just getting fired from their jobs and deeply in debt, but their lives are threatened as well. The novel ends with a denouement somewhat similar to silence of the lambs. I liked Angela character because in spite of being teased by the sadist she is so bold and their struggle to cure her daughter was very heart touching and emotional. They have struggled a lot to keep her daughter safe.